I found the insect in my swimming pool this morning. I do still have it if you need it. Thank you very much but the photo documentation is fine that definitely is a cicada killer. 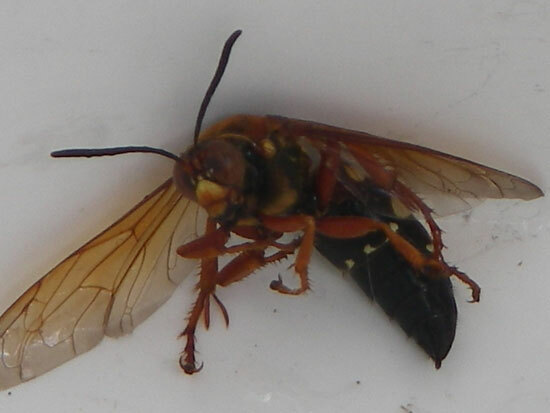 Somewhere around where you found the Cicada Killer there must be an established colony. Not to worry though, these wasps are really quite harmless as the males don't have stingers and the females won't waste their stings on you or me, their stingers are just for cicadas. If you manage to locate the colony, I'd like to come down there and investigate. Thanks for the data I really appreciate it. Thanks for the information. I will let you know if we find the colony.